Description: In a world after death, Yuri, the leader of the Shinda Sekai Sensen, rebels against the god who destined her to have an unreasonable life. On the other hand, Tenshi (Angel), the chairperson of the student council for the world after death, battles against the SSS members. SSS members utilize armed weaponry to battle it out against the angel's harnessing supernatural powers. A prequel to the anime, showing the formation of the Afterworld Battlefront. Thus, TK is still a mystery. perhaps.. tk... for teamkilled? In a rap battle? we'll find out sooner or later. Btw has anyone tried the angle beats visual novel? (it came out a few months to a year ago I think, or maybe that was the demo, can't remember) What was it like? 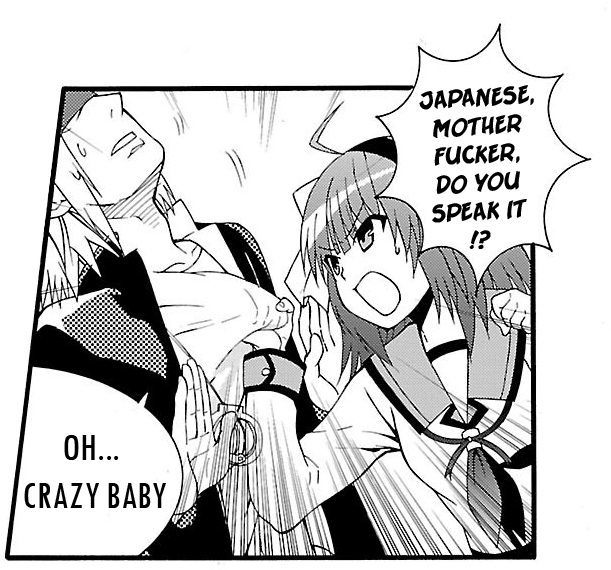 I'm still waiting for the official english translation. Around this time last year they announced half of it was already done. TK! DON'T LET ME CRY!! What an entrance, TK. Throwing Yuirippe against a wall. public disclosure for chapter 39 (when it gets through moderation): MACVaquez posted that they were going to upload it a few days after valentines, but they probably forgot, so I decided to upload it here 5 months later. Did a 360 no release! I'm still waiting for the day TK makes his appearance. But hey nothing to complain when I got Yurripe and Tenshi on the field. It's announced that Angel Beats! - Heaven's Door has surpassed printing 1,400,000 copies. I've never thought that Yusa was fcking scary. VN in this case is merely an imitation. The anime will always be the original. However, I hope they explore the story well since that's an advantage of having a visual novel. But I have no doubt that Key will do a splendid job like they did with their other series. Having multiple heroine routes doesn't really affect the overall story when Key is involved. not really understanding what happened though. reprogrammed her fear of men? or does she just remain apart from guys as an operator and carry on that way? Did not expect it to be Yusa! IKR?!!! I was mind blown. Then again, didn't really get her hair or eye colour so it is understandable.